If you thought widescreen TVs were impressive, Philips will soon be offering what can only be described as the Mac Daddy of widescreens – ultra widescreens – appropriately named the Cinema 21:9 LCD TV range. 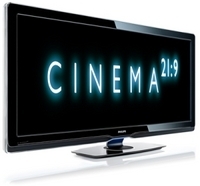 Think of it as bringing the cinema to your living room… well kind of. It replicates the same ratio as the silver screen (so say au revoir to those horrible black outlines), but it certainly won’t be the same as taking a trip to the pictures – though it’s the closest you’ll get to in-house cinema. The 56-inch monster comes with Philip’s Ambilight technology too, which means you can expect light effects around the TV that corresponds to the TVs content, for a much better viewing experience, as well as reducing eye strain. It’ll be available across Europe come spring time. The official launch however, takes place on the 29th January, so expect more info around then and maybe even a video.